The T-Mobile HTC HD2 is the biggest, baddest Windows Mobile touchscreen you can buy, though you wouldn't know it with HTC's impressive Sense interface. PhoneScoop reviews this tablet phone, which could be the pinnacle of the current generation of Windows Mobile. 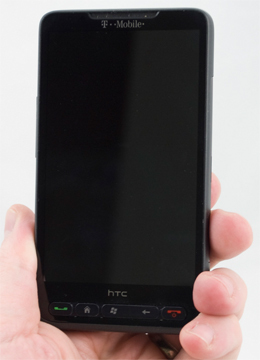 The T-Mobile HTC HD2 is the largest touchscreen phone on the market, running Windows Mobile 6.5 with HTC's Sense interface concept. If you like Web browsing, showing off photos or watching movies, you'll appreciate the large display. Even buyers considering a tablet, like an Apple iPad, will find plenty of ebook reading and multimedia software on board. The Mate 9 is Huawei's flagship handset for 2016 and it's an impressive device. This over-sized Android smartphone comes in an attractive glass-and-metal form with top specs buried within. HTC's Bolt for Sprint is a larger, more grown-up version of the HTC 10. It pairs HTC's high-quality hardware with Android 7 Nougat and Sense UI for a flexible, powerful combo. Samsung's Gear S3 is a capable smartwatch that stands on its own thanks to LTE radios and the ability to take calls and send messages. The form factor won't appeal to everyone, but the overall performance is quite impressive. This phone is just too big for everyday practical use. Imagine this brick when you put a skin on it, even bigger. The overall size is barely bigger than an iPhone. There is very little extra space around the screen like on most other touchscreen phones. The HD2 is almost completely screen. Having a clock in the top bar in all screens is available in the settings(settings > all settings > clock and alarm > more > display clock in title bar in all aplications), and you can rearange the order of the Sense tabs (settings > personalize > home screen tabs).